For some time, observers have talked about the Russian military as a force of roughly 1,000,000 soldiers. But its legal ceiling was above one million, while its true personnel number was below that level. 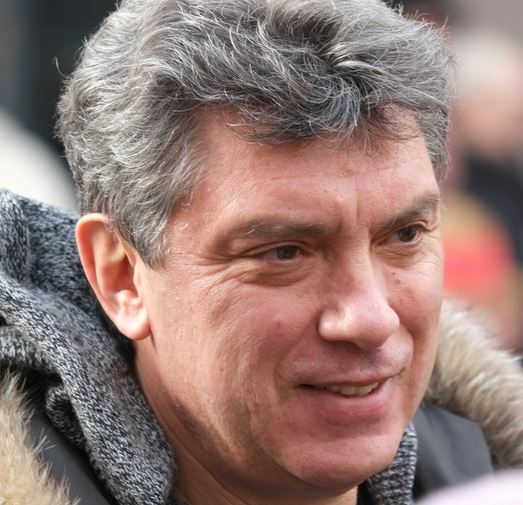 Now Moscow has, for the first time, a statutory limit of 1,000,000 uniformed personnel. This week President Vladimir Putin decreed a manpower limit of 1,885,371 for Russia’s Ministry of Defense. One million will be uniformed service personnel and the balance civilian employees. RIA Novosti reported on the decree. It replaces one from January 2008 specifying 2,019,269 with 1,134,800 in uniform. In a largely overlooked December 2008 act, former president Dmitriy Medvedev decreed that the limit would be 1,884,829, including one million serving in uniform, from the beginning of 2016. So Putin has authorized an additional 542 civilian workers for the Defense Ministry. To round out this picture, Putin decreed a limit of 2,020,500 with 1,134,800 servicemen in 2005. Putin’s latest decree is the new benchmark. But who is that million? There are about 300,000 draftees in the armed forces at present. In late 2015, the military reported having 352,000 contractees. It announced it would take only 31,000 volunteer soldiers in 2016, and claimed its formations and units were manned at 92 percent of authorized manpower. If you take 300,000 + 352,000 and add in 220,000 officers and 50,000 warrants, it looks like armed forces of 922,000 or 92.2 percent of the current one million authorized. Another 31,000 contractees this year would be 95 percent. In late 2014, the Defense Ministry said 220,000 officers, 50,000 warrants, 425,000 contractees, and 300,000 conscripts was its goal by the end of 2017. That’s 99.5 percent of one million. Some 42,000 contractees will have to be signed up in 2017. Perhaps, just maybe, the days of undermanning at 766,055 servicemen on January 1, 2013 are behind the MOD. However, there are problems with believing it. Number one is the fact that no one talks about the rate of contractees leaving the armed services. Retention may be as good, but it’s not 100 percent. The addition of new volunteers isn’t a straight line up to 425,000. 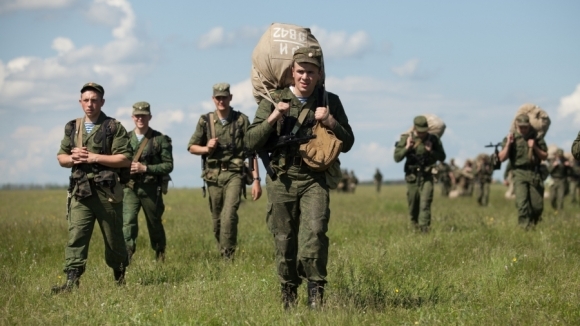 Beyond whether contractees stay are more important (and more difficult to evaluate) issues of the quality of recruits, what they learn in training, and what they add to Russia’s combat capability. P.S. Also notable this week was Putin’s signing of a decree on MVD manning which increases its personnel by 64,000 to 1,067,876 (872,970 police officers). This, and the MOD decree, are part of an apparent rewickering of the “power” ministries that began with the establishment of Putin’s National Guard. Krasnaya zvezda always has interesting Internet polling. Yes, Internet. Not a scientific opinion survey based on valid sampling and a mathematically acceptable margin of error. We’re talking about Russia here. We take what we can get. 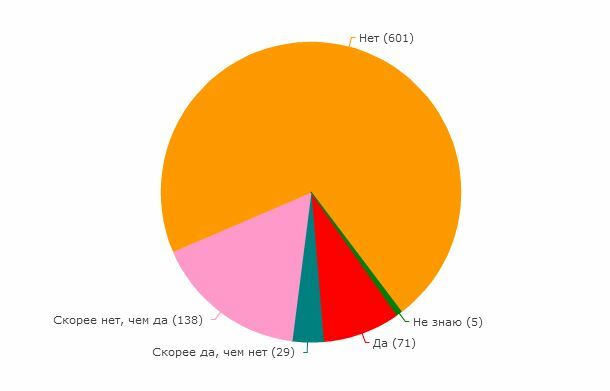 KZ asked its readers whether the current year of conscript service is sufficient to make a real soldier. Not surprisingly, 601 of more than 800 respondents said no, it isn’t. Only 71 said unequivocally yes, it’s enough. Being the MOD’s daily paper, KZ’s readership is mostly those in the Russian armed forces, or those somehow interested in them. The MOD wasn’t happy about the shift to the one-year draft several years ago. But it had no alternative facing the twin pressures of rising draft evasion and increasing violence and other abuse in military units. At least 12-month conscription helped alleviate both of those problems if it didn’t do anything for the military’s readiness. Hence, the great renewed stress on trying to sign up contract enlistees. The confluence of recent news stories makes an update on the health of Russian military forces opportune. As elsewhere in the armed forces, the military’s medical situation seems generally better compared with two or three years ago. 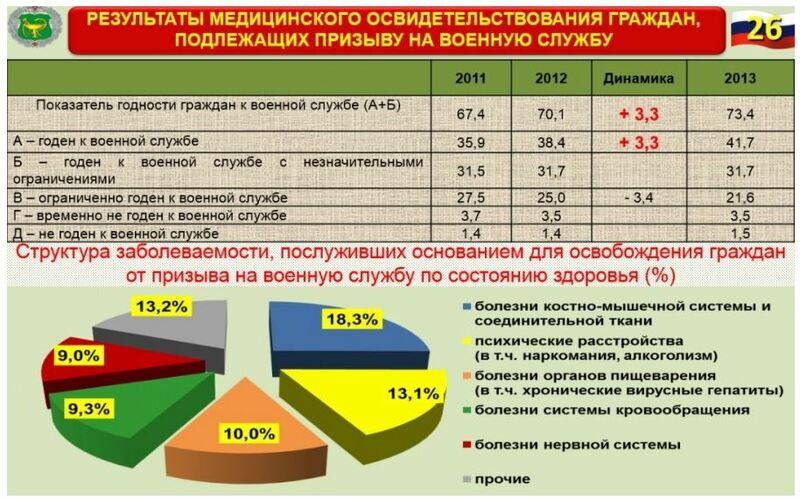 According to Izvestiya, the chief of the Main Military-Medical Directorate (GVMU), General-Major Aleksandr Fisun told the Defense Ministry’s Public Council that illnesses in the army declined 13 percent in 2013. The illness rate in 2012 had been 40 percent higher than 2011. The MOD attributes the improvement to better living conditions for soldiers. These include heated barracks, washing machines, shower facilities allowing troops to clean up more than once a week, and socks replacing foot wrappings. Fisun said, among conscripts, 60 percent of illnesses were respiratory in nature, while about 14 percent involved skin conditions. Valentina Melnikova of the Committee of Soldiers’ Mothers (KSM) told Izvestiya commanders have been the problem. However, she said Defense Minister Shoygu has said any soldier not allowed to see a doctor can now turn to military prosecutors for help. 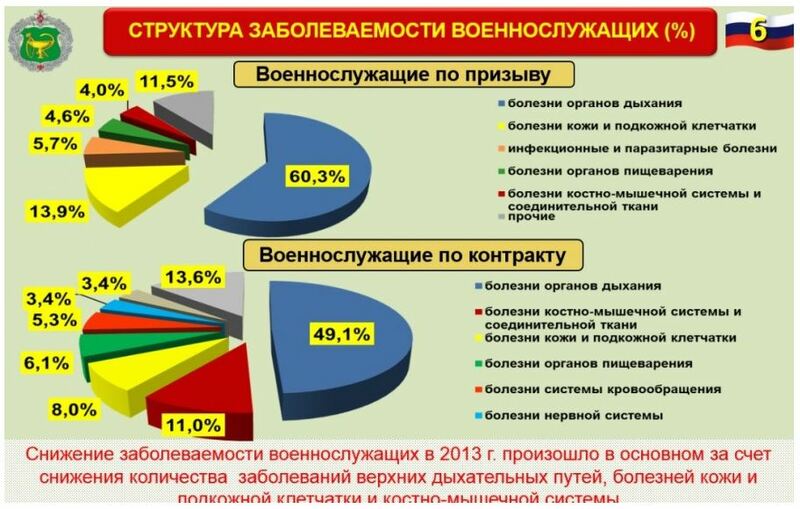 Bmpd.livejournal.com published Fisun’s pie charts from his presentation to the MOD’s Public Council. There are separate pies for conscripts and contractees. Respiratory diseases, however, were the largest problem for both groups, accounting for half or more of illnesses. Fisun also presented data on fitness for service among this spring’s conscripts. The tabular data shows an increasing number of young men are fit, or fit with insignificant limitations, to serve in the armed forces (73.4%). Most of that improvement apparently comes directly from decreasing the number of potential soldiers considered to have limited fitness for service (21.6%). Reasons for “liberating” citizens from serving were pretty evenly distributed among, in order, muscular-skeletal and connective tissue diseases, psychiatric disorders (drug addiction, alcoholism), digestive system diseases, circulatory diseases, nervous system diseases, and other. KSM’s Melnikova told Interfaks-AVN that illness was still the major issue for young men facing the spring draft. She indicated 80 percent of complaints coming into KSM concern unfit men who were drafted. In Moscow, some conscripts with documented health conditions were deferred until fall under additional medical observation, but others were told they have to serve now, and had to turn to the courts for relief. Meanwhile, the GVMU is reportedly amending physical standards for Russian Spetsnaz and VDV soldiers. It’s lowering the height requirement by 5 cm (2 inches), and increasing the weight limit by 10 kg (22 pounds), according to Izvestiya. Spetsnaz and VDV may soon be as short as 165 cm (5’4″) and weigh 100 kg (220 pounds). The new standards will apply for conscripts, contractees, and military academy cadets. Izvestiya was told a Defense Ministry order officially putting these standards into effect is expected in 2-3 months. Its VDV source said the increased weight limit is related to use of the newer D-10 parachute which can bear up to 120 kg, so it can support a heavier jumper along with 20 kg of gear.